When employees come to work sick, their presence affects everyone else at work. Some employees do not realize right away that they suffer from a cold, flu or other virus. Unfortunately, other employees are full aware of their illness and come to work anyway. While some employees clean their workplace with mild cleaners, this is not enough to minimize or prevent the presence of cold or flu-causing germs. Discover why having a professional janitorial service to clean workplace surfaces is a crucial measure to lessen the risk of other employees getting sick. Learn how having a janitorial service clean your workplace from cold and flu germs means less sick days. 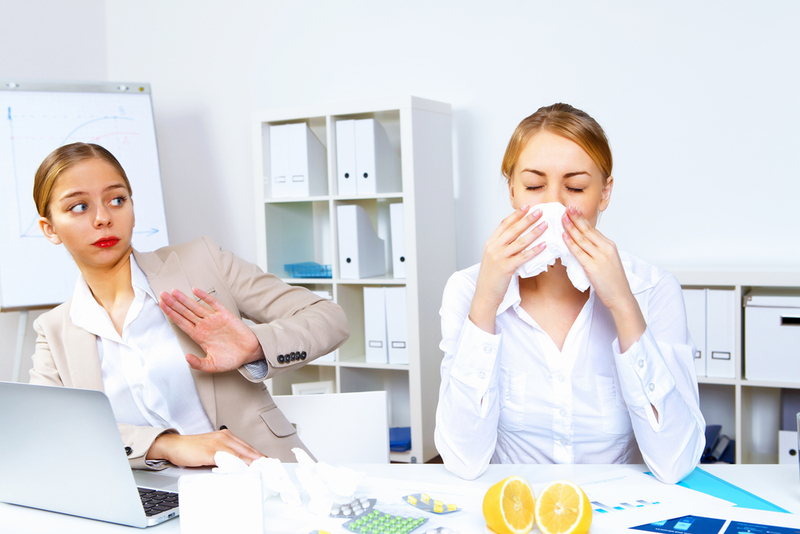 Cold and flu germs spread quickly throughout a workplace. All it takes is one employee, one client or visitor to enter the workplace while sick with the cold or flu to potentially spread cold and flu germs throughout the entire workplace. Most people likely remember a time when it seemed everyone got sick with a cold, flu or other virus, resulting in having to take time off work. Sick days cost employers billions of dollars every year. For example, The Fiscal Times points to data from the Centers for Disease Control and Prevention (CDC), indicating that the “Typical” flu season comes at a cost of approximately $10.4 billion in hospitalization and outpatient visits alone, not even taking into account the costs related to days off work. Similarly, Forbes points to research indicating that lost productivity from sick employees having to take time off from work or coming to work sick and not working to full potential costs U.S. employers an estimated $227 billion annually. Costs related to employee illness from cold and flu germs potentially go up higher than normal from the employees who report to work with a cold or the flu, spreading their germs to other employees through a variety of means, including contact with workplace surfaces. There are effective ways for employers to quickly minimize and prevent cold and flu germs from spreading throughout the workplace. While cleaning products that you purchase at the store may smell nice and fresh, the fact is that the overwhelming majority of these sprays, gels and liquid cleaners do absolutely nothing to kill dangerous cold and flu germs. You need to have workplace surfaces cleaned by a professional janitorial service with the knowledge, expertise and experience to professionally clean all the workplace surfaces. When you trust a professional cleaning service to clean your workplace, you have the satisfaction of knowing that the professional staff cleans, sanitizes and sterilizes workplace surfaces, effectively getting rid of and preventing cold and flu germs. Business owners and managers experience the full benefits of having a clean workplace, resulting in less sick days. Lessen the risks of suffering lost productivity and increased costs due to sick days. Trust the professionals who deliver expert cleaning services to clean cold and flu-causing germs from your workplace.